The feeling that City Hall made up its mind how it wanted to make major land-use changes in Seattle without asking the public isn't just NIMBY paranoia. Several insiders confirmed it during testimony in recent appeal hearings. 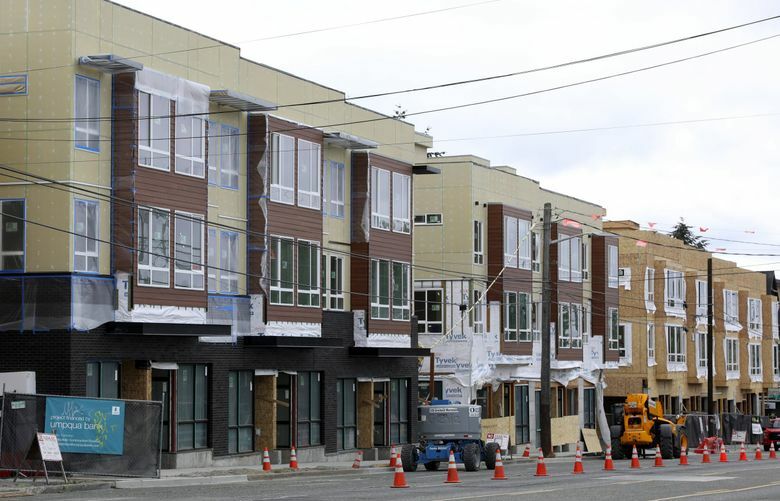 The sweeping plan to upzone 27 Seattle neighborhoods to create taller, denser housing has been given the green light, and is almost certain now to sail through City Hall in March after more than a four-year fight. But some tidbits of insider testimony from a recent challenge to the city’s Housing Affordability and Livability Agenda (HALA) plan give some clues as to why it has been such a struggle. And also why the fight won’t likely end this spring, as the city hopes. The first came when a city consultant was asked why there was little consideration of alternatives that didn’t involve broad “upzones,” the term of art for increasing the allowable heights or density limits for buildings that are being newly developed. “Upzoning is baked into the cake,” he said of the city’s plan. Another consultant for the city, former city Councilmember Peter Steinbrueck, put it another way. At the time he was hired to get input from various neighborhoods on planning for their growth, and he says he was told by a senior planner at some point that it was moot. Political. Baked in the cake. That’s what has most bedeviled this effort from the start — even more than the specific substance of the land-use changes. The idea of allowing developers to build one or several stories higher in exchange for including, or paying for, some low-income apartments is a good one, and it’s not new. It has worked in cities around the nation for more than 40 years. But our plan was hatched behind closed doors, in meetings not open to the public, as convened by former Mayor Ed Murray. The end result got self-dubbed the “Grand Bargain,” as it was seen as striking a truce with powerful developers who had been threatening to sue the city over paying fees for affordable housing. The obvious peril with making a deal without public input, and also calling it “grand,” is that there’s not much daylight for the plebeians to come along and have meaningful input into how it’s carried out. Even the “grass-roots group” that then pushed the bargain, called Seattle for Everyone, was later found to have been bankrolled by development interests. Combine that with zoning decisions that affect tens of thousands of privately owned lots, and it’s a recipe for suspicion. “It is certainly the case, at least in part, that the choice not to tell a more detailed story of the City’s neighborhoods contributed to why the City faced a very protracted appeal and hearing process from representatives in many of its neighborhoods,” the hearing examiner Ryan Vancil wrote late last month, even as he ruled that the city’s plan could go ahead. By contrast, check out what just happened in Everett. That city completed a major upzoning of its downtown and surrounding neighborhoods that the local paper, The Herald, said could “radically alter” the city. It had all the hot-button stuff in it — reduced parking requirements, taller buildings and an inclusive zoning element in which developers building higher could pay for affordable housing. But that plan was drafted through a community-input process in 24 open public meetings. Not everyone was happy — some neighbors posted 15-foot-high banner signs protesting it. But it was also extensively modified to adapt to block-by-block concerns. It took Everett two years to pass this. We are now into year five. In that time, developers have put some 40,000 units into the Seattle pipeline, with many of those grandfathered with no affordable-housing requirement while our process has bogged down. This is no small lost opportunity: We’re talking about potentially several hundred million dollars’ worth of lost affordable housing. The urbanists blame the NIMBYs for this debacle, and vice versa. But Everett has these factions, too. Here, some groups warn that if there isn’t more neighborhood input included in the final deal when the City Council inevitably passes it, then they plan to appeal it yet again, to the state growth management board. That was me, writing more than three years ago, after the “Grand Bargain” was first announced. We’re three mayors on since then, but that asking never really came. Take it from the insiders — it was always baked in the cake.